Hige Five, developers of Computer Music's Make Music Now series of iPhone/iPod touch apps, have just released their latest creation, Aura Flux, for iPhone and iPad. Aura Flux is a universal iOS app that enables you to create elaborate ambient soundscapes via an intuitive node-based systems. Each node is loaded with its own sound, editable in terms of pitch, trigger rate, volume and decay. Added, postitioned and triggered using multitouch, nodes interact with each other in a 'network' to generate incredibly intricate rhythmic and melodic patterns. Everything is automatically kept in key at all times, but while it's impossible to hit a bum note, the user is nonetheless given a very high level of musical control, making Aura Flux a great tool for serious and casual musicians alike. "Aura Flux was designed to be as simple, fun and as powerful as possible," says developer John Whitmore. "You can dip in for five minutes or get lost in it for hours.With Aura Flux we've developed a completely new interface that gives the user more control, at the same time radically simplifying the process of creating detailed and organic ambient music. We've also included a ton more sounds and options that really free the user to unleash their creativity"
"For the most part Aura Flux is about building visual structures made up of connected nodes that interact with each other to create music," adds designer David Newman. "Once you have a structure in place, you can sit back and listen or get in there and tweak to hear the subtle differences. The way in which the nodes are connected and their individual settings contribute to the way the sounds are played back, and often small tweaks can result in big changes in sound. The result is a constantly evolving soundscape with rhythms that come in out of play - in a way that's vaguely reminiscent of the music of Steve Reich, Philip Glass or Steve Hillage." 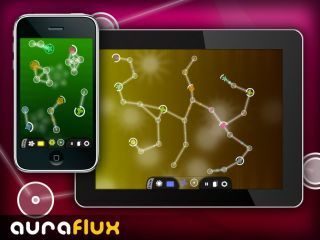 Aura Flux is available on the App Store now for a bargainous £1.19. We'll be reviewing it fully in a forthcoming edition of Computer Music, but for now you can find out more on the Hige Five website and check out the video below.